Welcome to the Bella Vista Garden Club website. 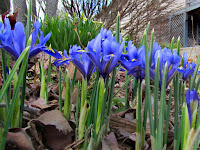 If you are interested in gardening in Northwest Arkansas, you have come to the right place. 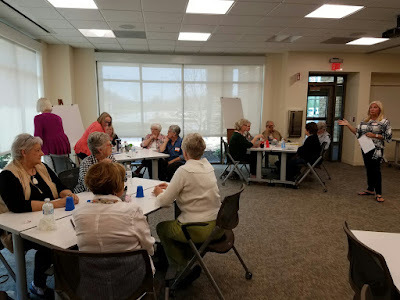 A focus retreat was held in the Community Room at Mercy Clinic, One Mercy Way in Bella Vista on April 5th from 1 - 4 p.m. President Judy Jeffrey presided over the meeting and twenty-five members attended, divided into small discussion groups. Comments of each group were recorded on large flip charts that could be viewed by all. Kim Carter (above, far right) was the facilitator for the retreat. Later, the president and the facilitator summarized the input and reported to the Executive Board and the BVGC membership on further measures to improve projects and club efforts to support the stated purpose of the club. Program: Jeff Overturf (above right), from Overturf Lawn, spoke on home irrigation and water conservation techniques. 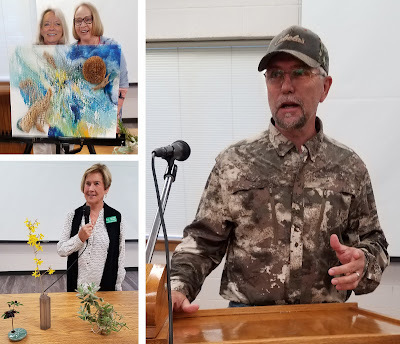 Floral Design Workshop: Linda Neymeyer (above upper left with Barb) provided information on "Still Life and Collage" designs as entries in the Fall Flower Show. She showed an example created by Barb Templin. A tutorial on entering horticulture in the flower show was given by Horticulture Entries Chair Virginia Halman (above lower left). Horticultural: Tony LiCausi spoke on methods to improve and retain the quality of your garden soil. Social and Lunch Time 11:00 a.m.
Meeting Starts at 11:30 a.m. Program: Ryan Neal, Benton County Extension Agent - "Gardening Topics"
is taking a break till spring. Nominate any yard (private residence or business) that is above average in design and the way it is maintained. We want to recognize yards that improve the overall look of our community. New Link: Consumers Base - This site has A Comprehensive Guide to Container Gardening that is very informative along with other gardening information. New Link: Yard Care Guru - This site has a multitude of links of information and this link has the Ultimate Beginners Guide to Gardening with Kids. New Link: University of Arkansas Yard and Garden - Pruning Crepe Myrtles - This page has information on pruning crepe myrtles and other links to more information on this plant. New Link: Garden Smart TV - This site takes you to the Garden Smart TV programs shown on Public Television. New Link: Plant Care Today - This page of the site covers companion planting with tomatoes. Other pages have more gardening information. New Link: Ultimate Guide to Gardening Resources - This site is full of links with information on general gardening, planning a garden, educating children, indoor gardening, blogs and podcasts. New Link: Butterfiles and Moths - A database website coordinates up-to-date information on lepidoptera. New Link: How to Really Save the Bees - The lead story on the home page is all about bees – lots I didn’t know (forget the hives, just make them at home in your yard – see “maternity ward” subhead). Terrific video at the end too. 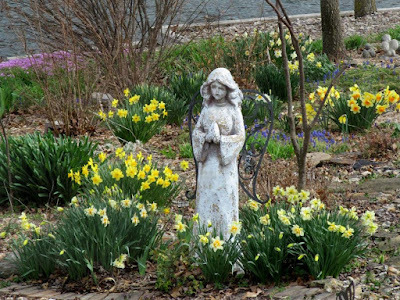 Support the Bella Vista Garden Club when you order bulbs and plants from Brent & Becky's Bulbs. 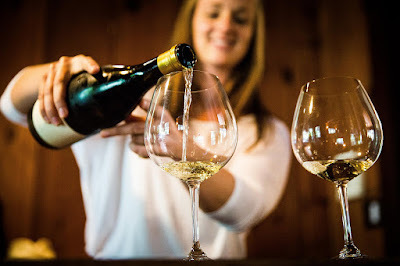 Just click on the Bloomin' Bucks link above, place your order and the Club will be a benefactor of a portion of your purchase for expenses for speaker, Brent Heath, on October 1, 2019. It is that easy! Join or renew your BVGC membership. Humming Bird Feeders should be out April 1st. Use 4-1 ratio water to sugar – you do not need to add red food coloring to attract the hummingbirds. Spring cleanup - Time to get the leaves cleaned out, weeds pulled and mulch put on the beds. Perennials - This is the month we go full speed ahead with planting perennials, trees and shrubs. 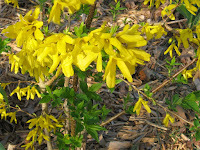 Annuals - Hold off on planting annuals and herbs until about the end of April or later. There still may be a few nights in the 40s and they just don’t like those cool nights. You can start to plant seeds once the ground has warmed up. Some years it is May before it is safe. 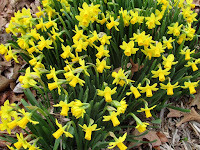 Bulbs - Be sure and leave the foliage on spring blooming bulbs until they turn brown or for at least six to eight weeks. The city if full of beautiful “Bella Vista” daffodils! You can plant dahlias late this month but be sure to mark them with a stake. Houseplants - I know you want to get some of them outside ASAP but please wait until night temperatures are 50 degrees or more… you both will be happier. Lawns - Don’t fertilize until about 2 weeks after green up. You need 1” of water each week. Roses - New growth is shooting out. Fertilize established roses but be sure to water before and after. Watch for black spot and treat early. Vegetables - Time to get the vegetable garden ready to plant with cool weather crops which can be planted from Feb-April - Lettuce, Kale, Greens, Peas, Turnips, Radishes some beans, beets, broccoli, cabbage, carrots and many others who prefer the cool spring and fall weather.